The below artworks are the most important by Eugène Atget - that both overview the major creative periods, and highlight the greatest achievements by the artist. Artwork description & Analysis: This image, depicted in an agrarian region in northern France, characterizes Atget's early style. The photographer identified himself with the French tradition of historicizing landscapes, with a total lack of reference to the classic conventions of framing and composition. This particular photo appears to have been influenced by Impressionist painter, Claude Monet, whose series of Haystacks was completed in 1890-91. The sleepy scene captures the quiet countryside and the timeless character of the French farmhouse lifestyle. The repetitive nature of the haystacks and the diagonal of the road push our view into the far-off distance. The scene is missing the presence of a farmer and livestock making it more of a meditation on the environment itself as the title suggests. As a documentary photographer, Atget described himself as a keeper of records. Occupying a unique position at the crossroads between the classical and modern era, he shied away from modernity in order to better prepare for its arrival. He used archaism to confront heterogeneous realities: his subjects often belong to the past; his Duchampian "found" images in the world announces new artistic uses of photography as a way to record reality. Postmodern artists such as Cindy Sherman, Barbara Kruger or Richard Prince will extend this practice by using documentary photographs in their own work. Although Atget would later become an important reference for the avant-garde with his photographs of famous Parisian architecture, Environs, Amiens is reminiscent of the time when he travelled across the French countryside (locations such as Rouen, Beauvais, and Amiens) in an acting troupe. Initially a sailor and a travelling actor, he lived near this area right before moving to Paris in 1890. Though Atget never considered his photography to be art, he nonetheless took cues from the great painters of his time to make his images more lyrical. 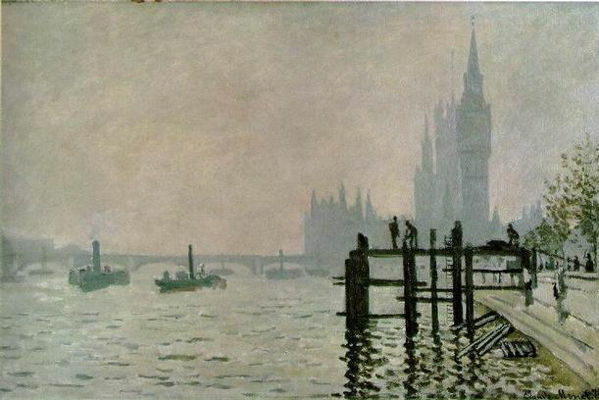 According to the art critic John Fraser, "his Rembrandt-esque ability to treat in exactly the same spirit the conventionally beautiful and conventionally sordid issued from the fact that in his approach to the energy of the city, he was able wholly to avoid these dichotomies." In his article entitled "Les spectacles de la rue", Robert Desnos associated Atget to the painter "Douanier Rousseau". 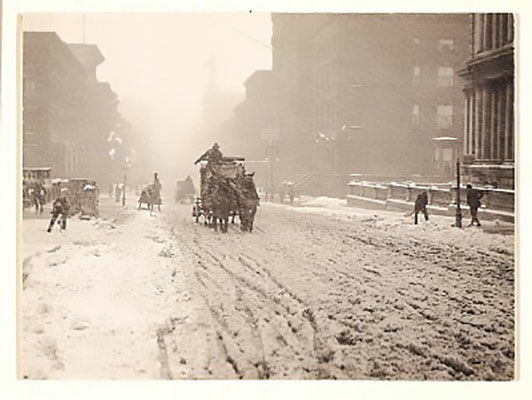 Albumen Print - The National Gallery of Art, Washington D.C. Artwork description & Analysis: This doorknocker, situated on a Parisian state institution building, epitomizes the grandeur of 18th century French architecture and decoration. Atget captures the quality of metal-smithing put into this doorknocker through the details of its wavy mane, furrowed eyebrows, and the careful pattern of the snakes' skin. He approached the ornament at a slight angle and emphasized the shadow and prestige. Atget worked with a large-format bellows camera, developing his own plates. His documentary purpose allows him to adjust contrasts in order to accent the details. He described the photo as, "completely beautiful", but there was another reason he sought to take highly detailed photos - in order to sell them to metalworkers, who would make replicas of the decorations. In 1890, he opened a studio specializing in source images for artists, architects, and set designers. The image was taken only a few years after an organization was established to preserve Paris's architectural heritage. He included it in his first album entitled, "Art in Old Paris." According to one of the great thinkers of the critique of progress - Walter Benjamin - this book announces the surrealist movement: "it gives free play to the politically educated eye." Bernice Abbott states that "we will remember him as an historian of urbanism, a true romantic, a lover of Paris, a Balzac of camera, from whose work we can weave a large tapestry of the French civilization." La Monnaie, Quai Conti is an essential photograph to Atget's compilation of Old Paris as it represents the official style of Louis XVI from the 1700s. The period style was largely associated with embellished and ornate designs that no longer fit into the new, grand style set forth by Napoleon III in the 1800s. The duality of his photo's use for both aesthetic appreciation and work purposes marks the transition of photography as being more than a document, but also an art form in itself. Artwork description & Analysis: A ragpicker takes up the entire frame of Atget's shot on a Parisian street side. With the background blurred, all the attention is focused on the trade of the man who poses with a very large wooden cart behind him. In 1898 Atget embarked on a project with the quasi-encyclopedic aim of capturing the old city of Paris under threat from new urbanization. With a series on the forgotten jobs, he showed people's day-to-day environment without embellishment. The photographer reveals the social and political changes that led to modern France. Following the path set forth by the quintessential French modernist, Charles Baudelaire, whose poem, The Ragpickers' Wine, illustrated ragpickers as, "Bruised by hard work, tormented by their years, each bent double by the junk he carries, the jumbled vomit of enormous Paris" - Atget continued this modern epithet and made the ragpicker part of his larger metaphor of the poet as a hero of modernity. 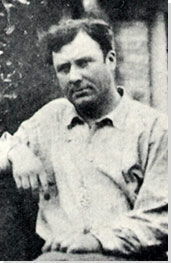 Writer Jules Janin considered the ragpicker's basket as "a great catch-basin into which flows all the scum of the social body". Furthermore, as someone who could personally identify with French workers, he frequently read leftist newspapers and championed the French worker in his subjects. Ragpickers wandered the streets looking for trash to be collected and resold. Their position in society is apparent especially when considering that livestock could easily replace their station. The ragpicker was explored by Édouard Manet, who undertook a series of pictures portraying street characters during the 1860s. At the end of the 20th century, contemporary artist Zoe Leonar defined the photographer him/herself as ragpicker. Artwork description & Analysis: A crowd of people shield their eyes to a solar eclipse taking place in one of Paris's public squares. The masses hold their viewing apparatuses in front of their eyes to view the moment when the moon blocks out the sun. The blurred nature of the photo comes from Atget's camera, whose glass plate negative needed a long exposure time to capture great depth of detail (his camera was best suited for taking images of buildings, not moving people). The mechanical vignetting is due to his having repositioned the lens relative to the plate on the camera as a way to correct perspective and control the image. Despite its aesthetic flaws, Atget pinpointed something in society much bigger than architecture - the shift of interest into new technologies with the dawn of modern manufacturing. L'Éclipse, avril 1912 captures the French public's fascination with the state-of-the-art gadgets. While the title suggests the image is about the solar eclipse, the image does not show the eclipse but instead insinuates the event with the gawking crowd. The photo attracted the Surrealists who wanted society to start concentrating on things more personal like dreams rather than collective thought. They renamed the photograph, "The Last Conversions" to mock the group mentality of Catholicism and their belief in miracles. Atget's studio was on the same street in Montparnasse as the studio of the Dada and Surrealist Man Ray who encountered the photographer's work around 1923. 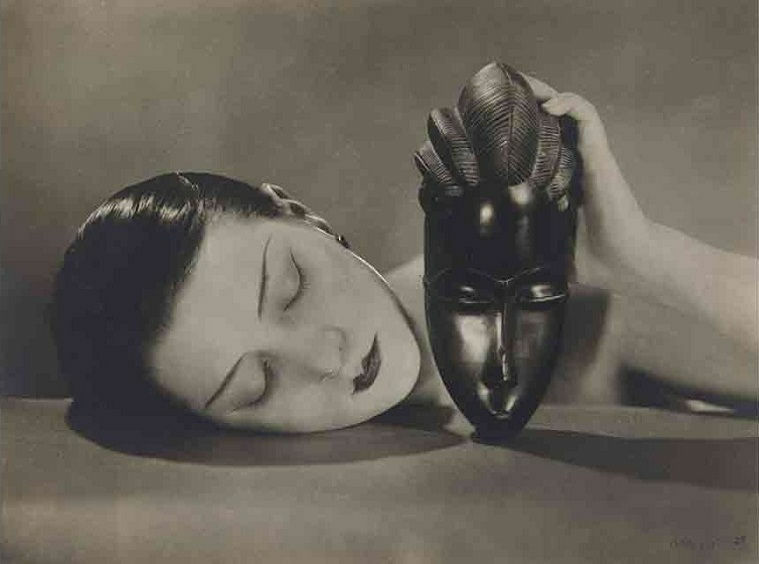 The photograph was purchased by Man Ray and became the cover for the Surrealist magazine in 1926. Artwork description & Analysis: This relief inset above the first floor window of the historic Chancellerie d'Orleans townhouse, also known as the Hôtel de Voyer d'Argenson, is an exact copy of a relief by French Renaissance sculptor, Jean Goujon made in 1549. Atget was particularly fascinated by the historic centre, whose buildings and magnificent palaces dated from before the French revolution. The relief symbolized the rebirth of art throughout history; with the nymph resembling artworks from classical antiquity and the replication of the relief signaled the rebirth of the French arts in the 1600s. Vanishing historical buildings, like the Hôtel du Cardinal Dubois, were up against a fast encroaching need to modernize Paris and rid the city of the old styles. Despite it being one of the most celebrated interiors in Europe, the mansion was demolished 1922-23 during the Haussmann renovations. Atget did his part to document the townhouse and the salvaged decor, though inaccessible to the public for many years after, has become a contemporary project of the World Monument's Fund and French Archives Nationales displaying the remaining furnishings as a part of French history. Artwork description & Analysis: This atmospheric street view of the Panthéon is an example of what Atget became best known for: photographs of iconic French architecture. A cobbled brick road leads to a church adorned with a colonnaded dome built in Neoclassical style. The photographer's point of view is very original and innovative. He chose an oblique perspective rather than a frontal view. Moreover, he overexposed the film in order to bring out the fog-veiled Panthéon in the distance. The sleepy early morning setting is void of any passersby and because of this, the image becomes more like a study of mood and the presence of architecture in the city. First, Atget took photos in the middle of the day to capture bright, natural light, but later he starting taking pictures in the early morning to achieve a softer, hazy light. The muted nature of the photo contrasts with the rich history and the supreme importance of the building itself. Originally, the building - a cruciform church, also a Baroque masterpiece, was dedicated to the saint of Paris, Genevieve. However, the church was repurposed during the French revolution and used as a mausoleum for important revolutionary figures like Voltaire, Rousseau, and Marat. The subtle presentation of such an important building is what makes his image more than a display of architecture in photography, but an enigmatic tribute to French history. Artwork description & Analysis: This classically inspired sculpture situated in the Garden of Versailles shows the mythological Cretan princess, Ariane, laying seductively on her lounge. Traditional Greek linens wrap around her full-bodied figure and flow freely throughout the entire sculpture like the organic and sensuous lines that emerge from an unrestrained mind. While resting her eyes, she dreams about the Greek God of wine and fertility, Dionysos. The Versailles gardens hold special value to the history of France since Louis XIV oversaw the design. The gardens became one of Atget's most photographed obsessions beginning in 1901 until his death in 1927. Little escaped Atget's tripod camera in the park, including its grand stairways, statues, vases, water fountains, and ponds. The story of Ariane finds its way into modern dialogue through her story of a promised eternal life as the daughter of King Minos. Though she is left by her lover, Theseus, who she helped escape from the Minotaur's labyrinth, she fantasizes instead that Dionysos wishes to marry her. Dreaming (or fantasizing) fascinated the Surrealists who strongly credited the realm of the unconscious to free minds, allowing for a purer state of being and a heightened state of creativity. The sculpture is in no small part a symbolic illustration of the uninhibited and imagined world that takes over our minds in our most intimate and erotically charged moments. Artwork description & Analysis: This is one of Atget's more playful images that he created toward the end of his life. Fashion mannequins scatter a display case like human surrogates, showcasing the trendy female fashions of the day. Their exaggerated gestures make for an odd display that is further complicated by various reflections in the window. Tree branches, a building opposite the storefront, and Atget's own leg overlap the scene and create new shapes and references. Photographs of the vitrines hold a special places in Atget's work. The treatment of light resulted from a masterful technique. The intermingling spaces, objects, and tones of black simultaneously merge and disjoint the photograph into the real and the reflected, making it a photo championed by the Surrealists and their love to explore the connection between fiction and reality. One particular image he took of a corset shop was used by Surrealists in their magazine as an account of a dream where the corset-dressed mannequin comes alive with connotations of sexuality and violence. While Atget captured urban life throughout most of his career, the department store display case is by far the most modern Atget ever became. Ironically, Atget created his images to be a lasting documents of what once was, yet the avenue still has an emporia devoted to the sale of clothes. Atget chronicled men's and children's clothing stores, along with other miscellaneous Parisian storefronts. When Printemps, the large department store, asked the French photographer Sabine Weiss to take photographs of their windows at every change of season, her images refer to this strong documentary tradition. They have now also become documents testifying to the consumer objects of the 1950s. The ambiguous space of this photo was first revered by surrealists like Man Ray and later sensed in the work of photorealist artist, Richard Estes. Like Atget, Estes captured photos of storefronts, but he later took the photos back to his studio to create various paintings; from similar handling of reflections, to works like Double Self-Portrait, that have multiple reflections within a single image. First published on 03 Feb 2017. Updated and modified regularly.